It started out as a school project and now a video about sexuality and advertising is spreading like wildfire on the internet. A scene from the Representations of Gender in Advertising video produced by three University of Saskatchewan students. 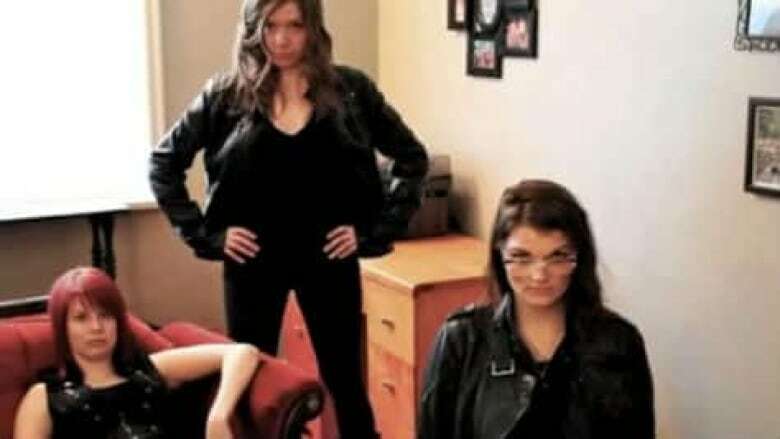 A video produced by a trio of University of Saskatchewan students is making waves online. Dylan Lambi-Raine, Kayla Hatzel and Sarah Zelinski created a video this spring for their gender studies class. It shows the use of suggestive advertising in mass media, highlighting inequities between the genders by reversing male and female roles. "Often men are portrayed [in advertisements] as strong, dominant, looking at the camera," said Kayla Hatzel. "Whereas the women are shown sort of draping over them, shown as subordinate, not looking at the camera, that type of thing. Very passive-looking." For the video, the students recruited male friends from Saskatoon to shoot the same ads, with gender roles reversed. "We wanted to have average looking people, from all different sizes, and if they wanted to be in the video we put them in," said Sarah Zelinski. "To show that this is what real people look like." The parody video turned into a YouTube smash, with more than 533,000 views as of Thursday afternoon. "We're all affected by the images we see every day," said Lambi-Raine. "Whether it's a billboard, or in a magazine or on television. Advertisements are not only selling a product, they're selling an embodiment. A relationship." All three women got an 'A' on the project. The video is now being used in several classrooms, including one at the University of Barcelona. "I've learned that you don't need to be a big person in the big media world in order to make a movement start, or to start a conversation or discussion," Lambi-Raine said.